Can pay-by-the-hole grow golf? @eGullGolf thinks it has a solution. As sure as the sun comes up in the morning and day turns into night, 18 holes at a time is one of life’s constants. Unless you’re one of those new age-types okay with only 9, that is. Why 18? The urban myth says the Scots played 18 because there were 18 shots in a bottle of Scotch. In reality, back in the late 1700’s St. Andrews morphed from a 22 hole course into an 18 hole course, even though it didn’t have 18 distinct holes. Evolution being the unstoppable beast that it is, the R&A would eventually deem a match 18 holes, no matter how many holes a course actually had. Today we buy golf our golf 9 or 18 holes at a time. The USGA, the R&A, the PGA and the Choir Invisible can debate ways to grow the game, but the 9 or 18 hole purchase remains sacrosanct and largely immutable. But what if you could actually buy golf by the hole? What if actually you could play, and pay for, only 5 or 6 holes before or after work, or in between sales calls, or when the kids are in preschool, or any other time you have a free hour or two? Logistical nightmares? Potentially, but French company eGull Pay thinks it has a solution, and it may be coming to a course near you sooner than you think. Any Uber user knows the ease of using your phone to get a ride: open the app and tell it where you want to go. The app knows where you are and it sends a car to get you. You meet at the pickup point and away you go. The app handles all of the billing. 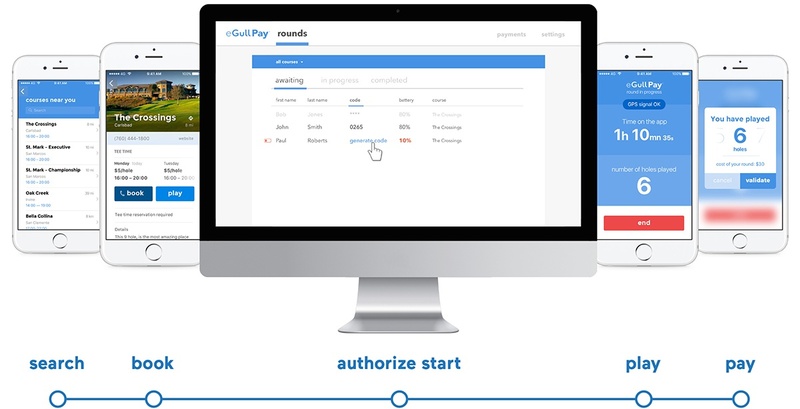 eGull Pay applies the same concept to golf. From there, your phone is tracked by GPS, just as with Uber. The app tracks the holes you play and when you’re done, you check out of the app and your credit card gets billed only for the holes you’ve played. eGull Pay then pays the course, minus its commission. Bottom line, you’re not paying by the 9, by the 18 or even by the hour. You’re paying by the hole. You no doubt have a few Yeah, buts locked and loaded, so let’s take a look at two key challenges eGull Pay faces. Is there a fear courses might get so clogged up with people playing 5 or 6 holes they’d lose revenue from full 18 holes rounds? Absolutely, but eGull Pay lets courses customize which days and times they use the Play & Pay As You Go model, and so far the two times sparking the most interest are twilight and early morning. So instead of paying a fixed twilight rate for 9 or 18 holes and racing to beat the darkness, you simply play as many holes as you can, and pay a per hole rate for what you play. There may be even more benefit early in the morning. That first group out has a wide open course in front of them, but another way of looking at it is there are 17 holes worth of unsold daytime inventory out there. 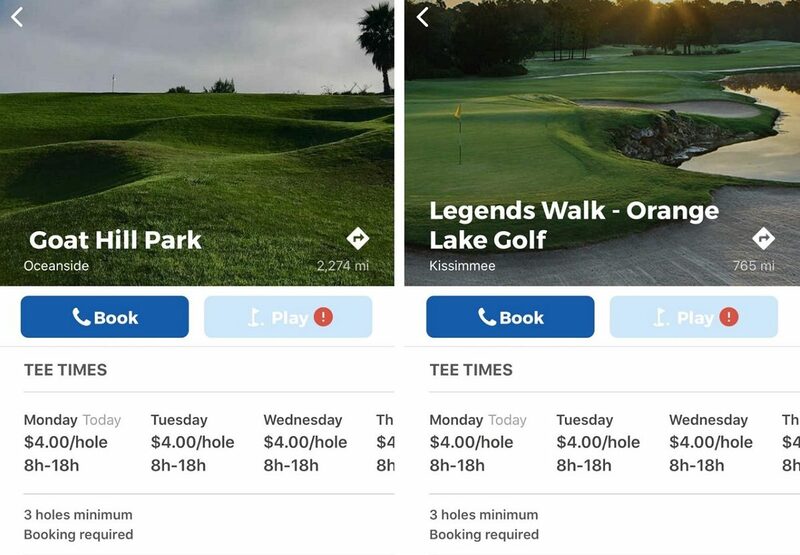 eGull Pay is free for both the golfer and the golf course, and courses can completely customize their per holes rates as well as when and for how long they offer per hole pricing. They also have the ability to change on the fly. For example, if a course finds itself with open tee times, it can activate Play & Pay By The Hole that morning, and deactivate it if some 18-hole reservations come in. That’s one of the reasons the app makes you call the course first to make a reservation – courses can say no if some 18 hole golfers show up, and to prevent course logjams. Not that we golfers would ever do such a thing, but what about trying to cheat the system? Make sure your phone is fully charged. The concept may also do away with the dreaded raincheck, which neither golfers nor golf courses like very much. Desert courses can also benefit, says Stolz. Courses can go pay per hole at 9 AM or so, allowing the golfer to quit when it gets too hot. The golfer still gets some golf in and the course gets revenue it otherwise wouldn’t. As the old business adage goes, a little bit of something beats the hell out of a whole lot of nothing. eGull Pay started in France as a scorecard/pace of play app. It wasn’t very successful until a partner course, Le Golf National (home of the 2018 Ryder Cup), asked if they could integrate a payment system, maybe even a pay per hole payment, in the app. Once the app was perfected and implemented, Le Golf National, as well as the largest golf course operator in France, fell in love with it. 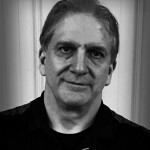 Stolz, a veteran of the North American golf industry from his days with TaylorMade and Cobra in the 90’s, was tabbed to bring the idea to the US. Among the challenges: modifying algorithms to recognize that while 99% of the rounds in France are walking rounds, 80% of the rounds in North America are riding. Stolz says courses will find incremental increases in food, beverage and pro shop sales as a result of Play & Pay By The Hole. In addition, the French experience has shown an unexpected benefit: growth. eGull Pay Beta testing in the U.S. started last November with two courses in Southern California. Stolz says one of those course is doing well with eGull, while the other has been a little slow in implementing the platform. As of right now, five courses in Florida and five more in Southern California are listed on the app, but Stolz since the PGA Show, more than 100 additional courses have shown interest. Surprisingly, resort courses are also interested. Obviously, the heavy traffic, 90,000+ rounds a year courses may not need it, but Stolz says very few courses in the U.S. are truly booked 100% of the time, 100% of the days. With only 10 courses in the fold thus far, eGull Pay has a ways to go. To spur recruiting efforts, they’re asking golfers to do some bird-dogging. To enter the sweepstakes you download the app, and then find courses that aren’t listed, which shouldn’t be hard at this point. 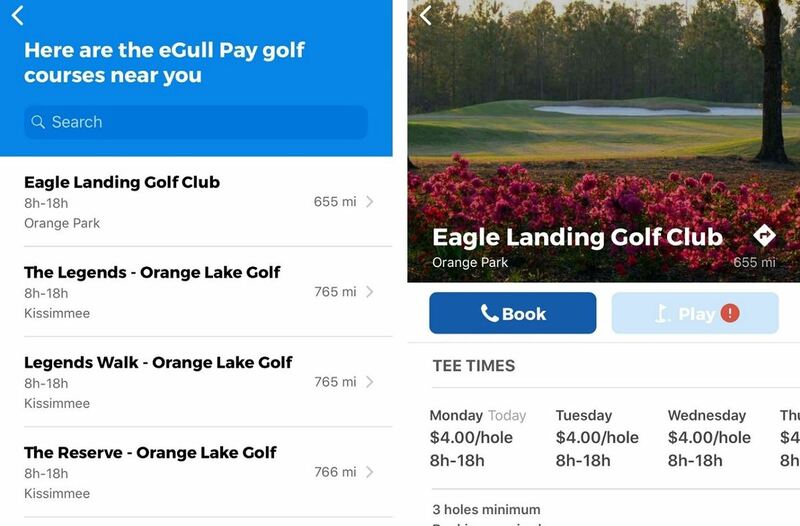 eGull Pay asks you to email the course GM or director of golf and tell them you’d like to see Play & Pay By The Hole, and CC the email to: [email protected] That’s your entry, and eGull Pay takes it from there. The contest runs from now until June 30th, with one winner getting the trip to the Ryder Cup and 50 others winning free holes of golf. While there are kinks to work out and unintended consequences to deal with, eGull Pay was one of the few non-equipment items at the PGA Show that made you go hmmm…. For serious golfers, Play and Pay By The Hole will never replace 18 hole rounds, but look at it from this perspective: if you run a golf course, your sellable product is a round of golf which is, by its nature, a limited inventory. Why not maximize that inventory when it makes sense to do so? Study after study says time is an obstacle keeping people from playing golf. If buying by the hole helps a course maximize its inventory without slowing down play, and if enough golfers like getting a few holes in when they have time, it seems like a win-win. Things change, and Business 101 says progressive companies try to deliver product in ways their customers want to buy it. No doubt the eGull Pay model has some challenges, but on its face, the potential is paradigm changing. What say you? Should golf courses embrace a pay-as-you-go model? I love this idea. As a husband and father of two, it is hard to find enough time to play a full 18 after already penciling in time away from the family to play 9 in men’s league. With the opportunity to play by the hole, I would easily get out 1-2x more a week during lunch. If the course can figure out the logistics, I am all for any measure that gets more people golfing and brings more revenue to the course. More revenue means better facilities, better maintenance, and lower prices for everyone. As a retiree this really doesn’t fall high on my list personally but I see value in the idea. I would support it as a revenue building idea for courses and a way to actually get more involvement in our great pastime. How desperate can you sound… want more people playing more golf? Offer a 9 holes rate after 1 or 2PM all week that is CHEAP. Say, 15 to 18 with a the ride! The course will stay full and so will your cash register….wake up! FYI – It’s the “CHEAP GUYS & GALS” that have stopped playing and that includes “Millions” of seniors on a fixed budget! I love all the naysayers. Reminds me of the golf club commercial where each older generation bad mouths the newer generation technology. Whether or not this tech works, a version of it will be implemented on courses that need to increase their revenue or die. Well you can throw all scoring out the window because it would be unrelate-able between players and the hours between 8am and 1pm would be a disaster for course bookings and profitability as players came and went every half hour or so and parking lots would have to triple in size just to accommodate the traffic. Pro shops would spend non-stop time just checking people in and out of the course – and you can forget the phone apps if you think the honor system is going to work …………. no, sorry just another hair-brain idea along with Frisbee golf….. and “Playing It Forward” ! Let me get this straight: You can play 9 or 18at a regulation Championship course or at an executive course or at a par 3 course (about 1.5 hours on a busy day for 9) let us not forget twilight and now we want to add golfers in to play 4 holes so they can get in everyone elses way? If this were the Gong show it would be loud in here right now. How about an app that shows people who don’t have time to play where the simulators, golf domes and driving ranges are located? Ernest had it right. Two 9’s are more than one 18,carts were optional, now included with a cost. They were once price for a cart, now per seat. Do you not think price per hole would be high. e.g. why would I pay $4per hole when a nine is $25. I would pay for 9 and play 7 , or pay $40 for 18 and play 12. The problem with low player is the cost. I know many people would play more if they were allowed to walk and it helps the pace as there are so many restrictions on carts. Right on … walking is faster and better for you and it is the way the game is supposed to be played !!!!!!! There are issues that would need to be worked out that have already been stated but as a working husband and father of three I could see me using this (or something similar to). I almost never have 5 or 6 hours to go play 18. I do have an hour or so several times a week that I could get in 4 or 6 holes. I play in a golf league at work that is 9 holes for 12 weeks. Other than that it’s maybe 2 or 3 times a year that I can play. I would gladly replace hitting a bucket of balls with playing a few holes. I think this has a lot of potential for adding some fun back into golf through convenience. Also, will allow me to work on my speed golf/golf polo skills and get some free golf in potentially. I’m assuming there is some sort of timer algorithm for each hole to determine if you played it, so Speed golf could become a HUGE hit. Someone mentioned it above but members at private clubs do this all the time. My home course has an abbreviated loop both the front and back that I use often. Generally, on the way home from work I can hit range balls and practice for 45 minutes to an hour and then take it to the course for 3-5 practice holes. Countless articles are written about this and I truly believe in it, practicing on course is essential and allows you to see if you can take your game to the course. The point here is that it’s practice. These holes that you’re playing aren’t intended to be used for handicap or anything official. Many courses don’t allow this because they rely only on 9 and 18 hole rates and it’s unfortunate. I understand there are logistical issues but from the article is seems there is enough flexibility in the platform that each course can tailor the application for the needs/limitations of the individual course. Agree.. I play 4-5 holes often at a public course where I have a membership. 1-4 brings you right back to the clubhouse at this course, as does a loop from 4-9. A great way to get a little course time in about an hour and 15 min. This concept certainly can work for those that are not intersted in keeping a full 9 or 18 hole score and just want to play. What people forget is that its very hard to improve by hitting range balls alone. You need to play to improve, maybe this gives some that aware they arent great players, the opportunity to play and improve without that pressure feeling of someone pushing them for 18 holes over 4.5 hours as well. Golf needs to encourage beginners or those with limited time to play if we all want to continue to keep courses open and operating, not shove people to the range if they cant spare 5 full hours at a crack or just want to practice a few holes. My course also runs a special every Monday… buck a hole Monday, since its typically slow on Mondays…. worked out great, many people take advantage of playing 4, 9, 12, 15, or 18 holes, whatever they want to play or squeeze in and have never had a problem with slow play due to the pricing format. The tee sheet is the golf course’s inventory. Every unsold tee time is lost revenue for a golf course. Too much lost revenue means either higher greens fees or going out of business. Is that what we as golfers want? At the same time, many golfers just don’t have the time to play even a full nine holes because of work and family demands. Should they not be given an opportunity to play? Or should they just be overcharged for the limited amount of golf they do play? The logistics can be worked out. People can be told how to safely get in off the golf course from the 5th hole. Courses will need to be judicious as to how they implement this so as not to pack the golf course too full. Again, the logistics can be worked out. More people playing golf and more revenue for golf courses. Tell me why again this is a bad thing? I think this is a great idea! I’ve already downloaded the app and contacted my home course. I’m a 13 handicapper and I love golf, but it’s challenging to find enough time to play. With this app, some of my practice time would be on the golf course. I’ll grab 3-6 holes and have some fun for 1-2 hours. Golf is FUN and the more I can play the happier I am. It would also be great to take my daughters out for an hour or two without needing to commit the whole day to golf. I could even pick them up after school and grab a quick four holes. I cannot imagine a better way to end the day. Just as important, I believe this is a way for golf courses to earn more revenue. More revenue means less courses that close. It could even mean opening new courses. Where I live we’ve had a number of private clubs close. Some of those were taken over and become public, but others became quarter acre lots. With this app even a private club could generate some extra revenue by allowing limited play 11-4pm or something similar. Do you want to grow the game? Do you want to keep golf courses open? Do you want to keep greens fees down? If you truly love golf you should love this idea. I don’t particularly like it, my suggestion if possible courses rearrange the course so that you have a choice and have every 6th hole returns to the clubhouse. Now the golfer can choose whether they have time for 6 holes or 12 holes or 18 holes and price accordingly, you have 3 price points, 3 opportunities to purchase refreshments and the wife won’t be mad if you are 1 hour so later. It could even be every 4 holes like a flowers petals with the last grouping be 6 holes – 4 price points. It is all about time and encouraging more enthusiasm to play, instruction is important fro the right source, it blows my mind when a 24 hdcp player is showing a 12 hdcp player how to hit a ball and the 12 hdcp is listening………………………………. If a course could be configured for this to work, I think this is a great idea as well. JUST LIKE EVERYTHING ELSE, THE MILLENIAL SNOWFLAKES WANT TO MUCK UP A 500 YEAR OLD GAME JUST LIKE THEY HAVE RUINED OUR SOCIETY. Yup, you keep that head in the sand. I’ve watched quite a few courses local to e go belly up for not adjusting to society! You wanna keep you 18 or nothing attitude then join a local country club and hope you can keep the membership up, pay your assessments and try and stay out of bankruptcy! This is a great idea and will get millenials and old guys like me out more often. Especially when I’m traveling and i don’t have 5 hours to sit behind “perfect” players! If i coul play-pay per hole I’d play a bunch more golf in areas i am traveling in. Coolest side benefit, if i really enjoy those four holes, i am more apt to return on a special trip and play all 18. But Obviously that won’t be at your club! Keep ignoring today’s golfers and all clubs will become housing developments! Pay by hole is genius!!!!!!!! Given that most courses are designed for playing a minimum of 9 or 18 holes, I could see this being a logistical problem for a lot of courses. Although, this might work well for more traditional courses where the holes are close together. That said, it would be interesting to see a brand new course built with this in mind. I’m envisioning a course designed in what I’ll call a “flower” pattern. Each “petal” is a series of 2-3 holes that would start and end in the middle. So basically, you play 2-3 holes and end back in the middle, start another 2-3 holes and end back in the middle, etc. In addition, you could also put a path around the perimeter of the entire course so you can skip to another “petal” if you wish. ^ Now that’s creative thinking!! I really like this idea. As a father of 3 young ones, taking 5+ hours (travel, warm-up and actually playing) for a round of golf on a weekend can be rough. depending on the course, pure a l carte pricing like $4 per hole would be a bit much for me, but if they priced it like individual holes for the price of 1/9 or a 9 hole round would be reasonable. I take golf seriously, but it comes down as a time issue for me, so saying “serious golfers” won’t use this, why not? if i have more limited time and this gets me onto the course versus the turf range so I can actually see if i’m improving, what’s the problem? As for sustaining an index, those players can then play 9 or 18, so that’s not really a issue. 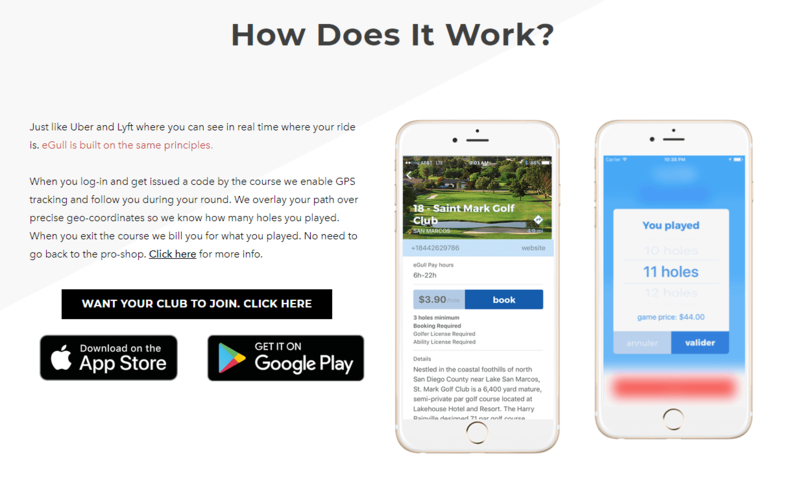 This isn’t the end-all, be-all app that will work for every course, every golfer in every market at every level, it’s a way to get people out to play a few holes to scratch the itch and get the courses some more income. Will it grow the game? no one can say yes or no until it’s tried. It never ceases to amaze me how people try to make this difficult game an easy one, and a required high level of commitment just a passing fancy. The game is hard and it takes a long time to learn as well as a long time to play (though there are clear areas of improvement in the latter). It also takes a continuing level of commitment to maintaining and improving skills. It’s not like riding the proverbial bicycle. Would one enter the mission of learning to play and developing ongoing skills for a musical instrument in such a cavalier fashion? Frankly, it is an insult to anyone who has worked at the game for people to inject themselves at a part time level, unless we are talking a First Tee for adults — not a bad idea actually. The game is not about bashing balls for an hour in a random sequence of holes (unless you are a kid sneaking out at dusk — a time honored tradition!). Reflexively, I recoil at anything French, but if this idea had come from a committee at St. Andrews I would still give it a thumbs down. I believe this idea falls under the category of “just because technology makes it possible does not make it desirable.” Then again people who cannot tell, within a fifty yard range, how far a given shot will go, for some reason want to know the exact distance, down to the yard, of a 175 yard shot from a fairway bunker. Oh, and make sure that chip is 16 yds., and not 15 yds. — before stubbing it two feet. We can just as easily kill the game with technology as with limited play or slow play, the latter often contributed to by over use of technology on the course for both golf related and social/work related activity. Full disclosure: I am an old codger who “dug his game out of the dirt.” I fully appreciate the technology in golf clubs and balls that have kept me active in the game. Modern GPS devices on riding carts certainly can speed up play and are helpful on strange courses. Even GPS wrist watches and such are helpful, if not redundant in the presence of the formerly mentioned devices. Laser range finders border on the absurd for most players, as the ability to control shot distance is no where near as precise as the instrument. They do help somewhat when there is no posted pin position, but again there is that rare ability to actually hit a ball a given distance. Anything could possibly help if it is cart path only, but nothing is necessary on one’s home course from any position. The problem with all these devices is that there is no training in how/when to use them — another vote for First Tee for adults. And yes, I think that would be a problem for both player and staff with regard to Egull Pay. I see a cluster **#” of limited hole groups plugged in between full round groups during the day or randomly shotgunned at the start of the day, with little or no marshalling possible. Talk about making me mad, just try plugging four beginners in front of me on the 11th hole, when our foursome is on a 3.5 hour pace. In fact, imagine that scenario when you have drawn the perfect tee time and the perfect foursome for your dream round at Pebble, and it turns into a six hour death march while the course tries to fill every hole at every moment. That is what will happen as courses grab for every possible dollar. Golf is not dying, but it certainly is contracting, and that may be a good thing. As with every eco-system, overpopulation is a killer. Until we get the number of facilities in balance with the number of people who actually want to play the game, we will not have a healthy golfing eco-system. Oddball attempts to entice more people to use courses on a limited basis will not cure the imbalance that exists, and we risk chasing away the dedicated golfer. Miniature golf is for kids, dating couples, and drunken sorority/frat members. A good time is had by all, and so it should be. Let’s leave the real golf courses to the real golfers. You sir are what give golf a bad name to non-golfers and make them not want to try the great game. It isn’t all about ego and showing people how good you think you are, for some it’s about going out and having a good time with friends and relatives. I personally work to make my game better but also get caught not being able to golf due to time. I have a course on my way home from work that I would consider playing a few holes on the way home to work on my game. Your snobbish attitude towards golf is what is driving up prices because people looking to golf for the fun of it, within the course rules, don’t want to deal with people like you looking down their nose at them. Courses need to make money to survive and will take any golfer they can. If you don’t want to deal with the occasional golfer they have private courses. I think it’s a great idea for the working man, especially guys doing sells on the road. One of the reasons I belong to a private club is so I could pop on the course in the evening and play a few holes before dark. Just have to figure out the logistics and more importantly, not gauge the price. Why don’t they have you pay at the end and your price you pay is based on how fast you golfed. Maybe this would speed some people up. There is a resort course in Missouri that’s offering a pay-by-the-hour model. Another interesting idea with some merit – would like to see how it works for them. This could evolve into something great. When I try to get some golf in before work, I often have to jump holes to pass slow golfers. I shouldn’t be penalized (i.e. paying the same but playing less holes) because my pace of play is faster than other golfers on the course. In fact, I should be rewarded. As the app learns my pace of play and my willingness to skip holes, I could be sent special discounted offers on rates per hole. The slow players who are adamant on playing 18 holes in order, should pay more. Imagine being able to see where other golfers and maintenance crews are, and shown what holes I can go to to keep playing golf at my pace. Everybody wins. I get to play more holes, maintenance crews do not have to race the first foursome, because early birds can skip them just like they would skip a foursome. Imagine getting notified on hole 15 that our foursome is on pace to finish by 11am. And if we do, we each get a free basket of fries with our lunch order. There is a lot to be done with this that would generate more revenue. I like it. Some interesting thoughts in there! And I agree … and it did seem to me to be some of the hoped-for goals of the app. If I have an hour…I can finish 9 holes in 60-90 minutes. 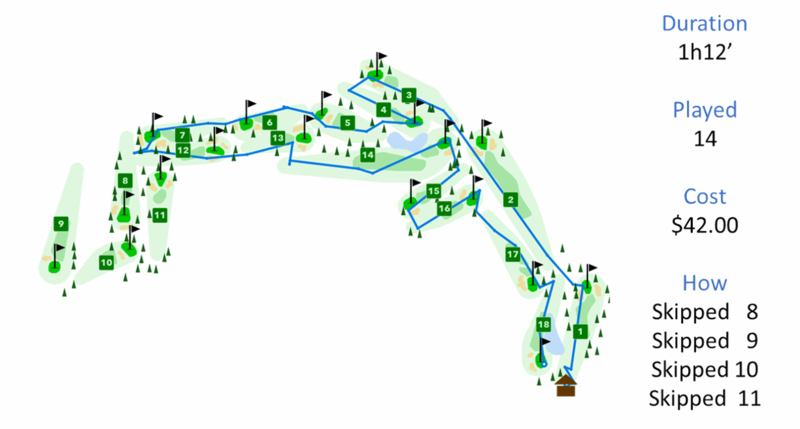 The number of courses with 9 hole pricing is often lacking still. Interesting concept, my first thought was won’t the first few holes get overworked and that will depend on how well you can slot people into random starting holes and still managed pace of play. It also makes sense where a course is “under played”. Appreciate the comments but what most are missing is this app will attract new players and fill up courses during non peak hours. The course chooses the times and rates. Courses need new revenue generators and this technology will attract Millennials, Executives who can play 4 or 5 holes at lunch, and anyone else crunched for time. By attracting new players that means more money spent in your pro shop, restaurants and even generate more lessons. I go hot and cold on this idea. Another problem I see, is how in the world are you going to Post a 5 hole “round”? How is GHIN going to deal with that? On the other hand with the tracking feature, slow golfers could be charged a premium for being “slow”. Might speed up the pace of play. This whole idea is likely for the somewhat less serious golfer. I am guessing that the majority of the folks on this site do not fit into the category. I predict that this idea will need a lot of time to gain any traction if it works at all. Wow, so many negative waves, man… (Name THAT movie, y’all.) Anyway, I think this is a fantastic idea if it’s implemented correctly. A course that uses this in conjunction with say GolfNow should see their mid week usage go way up. As to maintenance, groom 1-9 early on even days, pay by the hole on 10-18, then swap. It’s not rocket surgery if it’s something you want to try. I think you mean “brain science” not “rocket surgery”. Jon: Someone with a sense of humor. Thank you, sir! Kelly’s Heroes. And it is a fine idea that will survive if it works and if it does it’ll mean all the naysayers were wrong. Just because I’m an older guy does not mean I agree with the staid, old codgers that want golf to stay the way it is. There are a few guys that used to tell me how they don’t like the changes, etc. 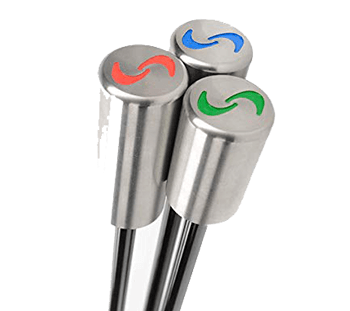 They stopped when I told them that they couldn’t play with their graphite shafts, titanium heads, solid core balls anymore and had to go back to hickory shafts, wood heads and gutt-percha balls…or shut up. They shut up…. Kudos to both of you for your knowledge of fine filmmaking. Kelley’s Heroes, one of the Greatest Movies Ever Made! What do I win? Yeah but if a course already doesn’t even want people who can only play 9 holes, what makes you think they would want to cater to pay-per-hole players? Certainly, there are some golf courses that can make what they need to make selling nothing but 18 hole greens fees. Good for them. This is for the rest of the courses out there that can’t get away with that. Give them a way to manage their inventory better so they can maximize revenue. Good to see this response, so many are quick to shoot it down. It can work under the right circumstances. of course there will be times/courses/dates etc where it won’t. But if many Pros and GM’s actually sit and think about it, they could gain some incremental revenue, and just as importantly golfers might be able to enjoy a few holes instead of passing it up or hitting range balls instead. But everyone should remember the guy who founded Fed Ex received an F on his paper outlining his idea for the concept. Really can’t see it working in the states unless they work out some issues that you’ve already mentioned. Your wrong about the beverage cart does it without slowing up golf. Not true, how many times we have had to wait on the cart as she/he is driving toward us to tee off, or 2nd shots from the fairway. Or when your playing behind a shotgun tournament and their all driving back to the club house when finished. It’s a nightmare with all the carts going every which way, toward you, driving across your fairway, etc.. I Just can’t see carts working with this, walking would be the ‘only’ option, and even that would have some scary moments. Then you have the issue if your a golfer with an index to sustain, you can’t use it. Just can’t see serious golfers going with this, so it leaves all the other groups who don’t take golf seriously. Pace of play would really suffer for the former as they catch up to those playing the holes in your examples. Early morning tee times with this system basically fails from the get go, as that’s the time frame coveted by serious golfers. You mentioned twilight as a possibility for obvious reasons you addressed, that would be the only time frame I can see this working in the U.S.,on 18 (or more holes) regulation courses. To me, par 3’s, and or executive courses may be a better venue for this concept. You raise some valid concerns – ones that eGull and any course that adopts this model will have to confront. Not with you on the handicap tho. I keep a handicap but take a day like today for example. Right now I’m at a professional convention in Maryland. I have a 3.5 hour break between sessions, and if there was a course nearby that would let me play 5 or 6 holes, great. Do I have to put those scores in for my handicap? I’d consider that More practice that anything else. I’ll still play 18 when I can, but ultimately it’s a game and games are meant to be fun. As for clogging up the course – that’s a definite challenge and the course would have to make judicious use of when and how long they offer something like this, and be smart about how many golfers it let’s use it. Keep in mind use of the program is fully customizable – a course would be crazy to use it full time, all day just to cram more people on the course. And from what I could tell from talking with Pascal, that’s not eGull’s intent, either. First off there is a course in maryland, that would let you do that, and you happen to know a guy!! Should have called! As someone who works at a course, sure it seems like there are a lot of logistical issues to work out. But it’s a very interesting concept, and if we often have dead times between say 1:00 and 5:00 PM and if we could fill those by people playing 5 or 6 holes at $15 to $20 a pop it could all add up. Also another way to look at it, instead of as a player hitting balls off a range mat for an hour at $10 or $15, what if you could play 3 holes at $10 or $15 would you find that more enjoyable? Ahhh the French so innovative, what do they know about golf? Maybe there should be an app that charges you more per shot! Speed up play for a change…. I’m not interested in this concept at all. I see it as a way for the courses to make more of a profit from us golfers. And the game is already expensive enough. $4/hole?!? No thanks. If it’s purely pro-rated (i.e. $18 holes @ $36 = 2/hole, then I’m in) Otherwise, I’m a hardliner who would rather not play at all, unless it’s 18. I think this is a silly idea. People will constantly be getting in the way driving back to the clubhouse or cutting in front of groups to play the last few holes to the clubhouse. Like Mr. Wonderful says on the TV show Shark Tank, take this thing out back and shoot it. It’s a loser. Interesting idea, my concern is the greens crews. Most courses send out a crew on the front and back in the morning to mow greens, rake bunkers, cut cups and do general maintenance. In the afternoons a lot of courses have mowers go out and cut fairways (clean cut when the fairways are dry) i’m sure the Greens Keeper won’t like this concept at all, and don’t we want everyone to get along??? My first thought is how much it will slow down play with people riding back and forth through holes where others are playing. I’m seeing a real problem there. No doubt that’s a concern – but it would be up to the course to manage that. The cart girl seems to get around without slowing down play (unless you buy something, then all bets are off). According to Stoltz, courses can decide when to use the system, so when a course is full there’s really no need for it. Saw another software system at the show that actually maps out where golfers are on the course and let’s the pro shop know where the gaps are. Might make a good marriage with eGull Pay. Hadn’t thought of that but it seems like eGull could implement marshaling pretty easily, provided they have enough users. That would give the proshop even more control in helping to speed up play. It think this is an interesting idea and interested to see if it can go large scale. I like the idea of an app that speeds up play. If you fall more than a half-hole behind it emits a loud siren that you cannot turn off, even if you turn off your phone. Or better than a siren, a voice on your phone cussing you out for being a slow poke asshat. Now that’s technology at its best!